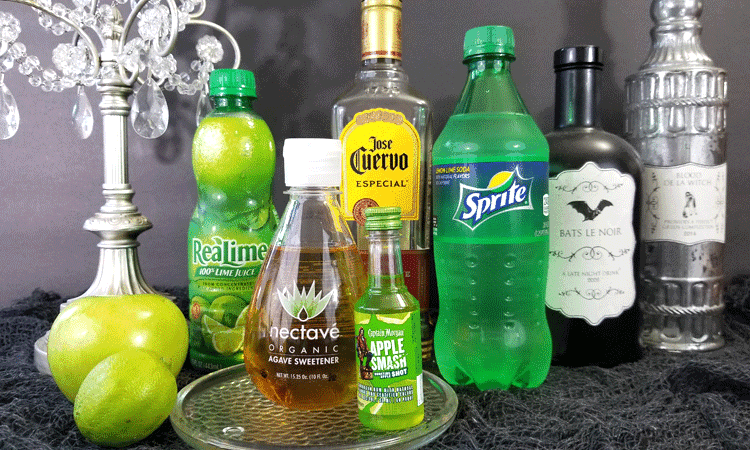 This is our final week of our Fall Cocktails series and this week we are finishing strong with Halloween drinks. 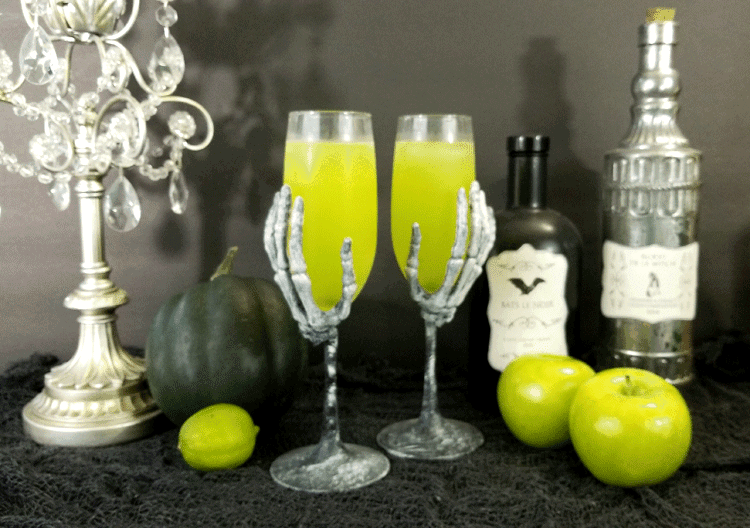 Peggy and I created an apple margarita cocktail that will knock you right off your broomstick. So gather your ghoul friends and lets get started! This was the perfect drink for my Skeleton Wine Glasses don’t you think? The color just pops and they turned out really yummy. They are easy to make and take just a few ingredients. Be sure to print out the recipe so you can make this every fall and Halloween! Gather your ingredients. We used tequila, Sour Apple liqueur, Lime Juice, Agave and Sprite. It was a fairly tart drink but I really think this was my favorite of the five we made. Measure them out. 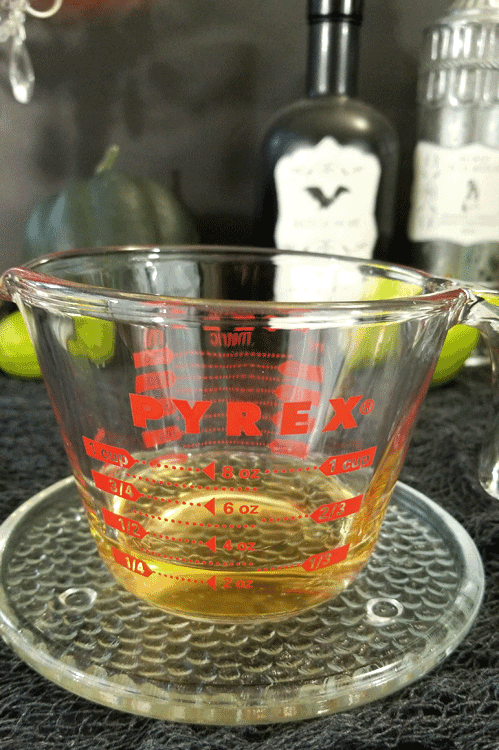 First measure the tequila into a measuring cup/container. 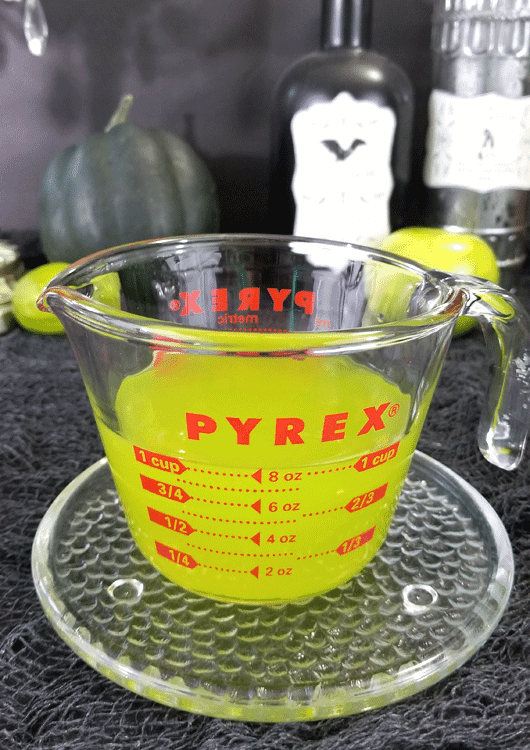 For two glasses measure out 3 oz. 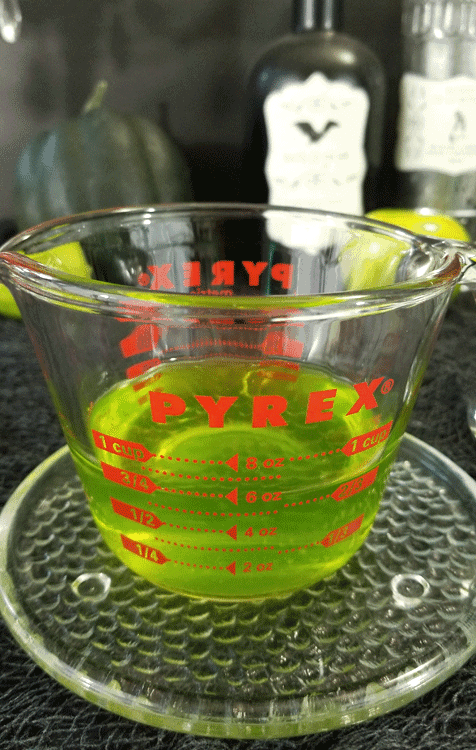 Add in 3 oz of the Sour Apple liqueur. This makes it a great color! Fill the glasses 3/4 full with the alcohol mixture. Use the Sprite to fill the glasses or to taste! Please be sure to visit the blogs of these awesome fall cocktails as well! They look amazingly spooky! 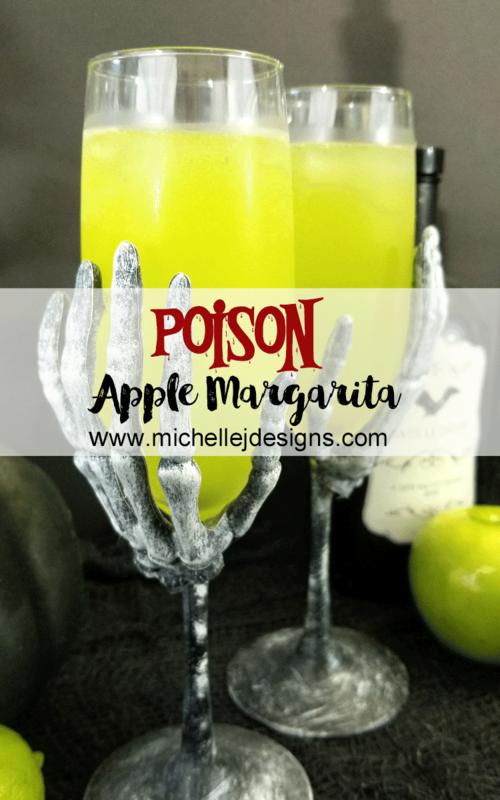 This apple margarita sounds so yummy! I absolutely love the skeleton glasses you used! Your pics are awesome! Thanks Michelle. I do love these skeleton glasses. They were a fun project! 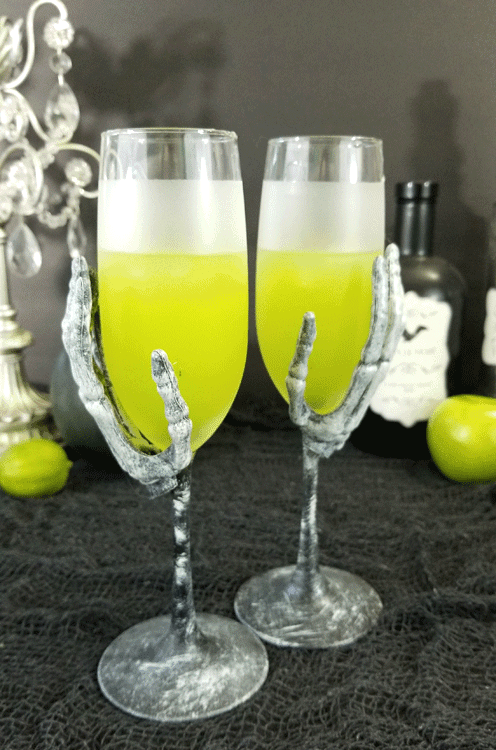 Margaritas are about my favorite drink, so of course, I will have to try this spooky version! 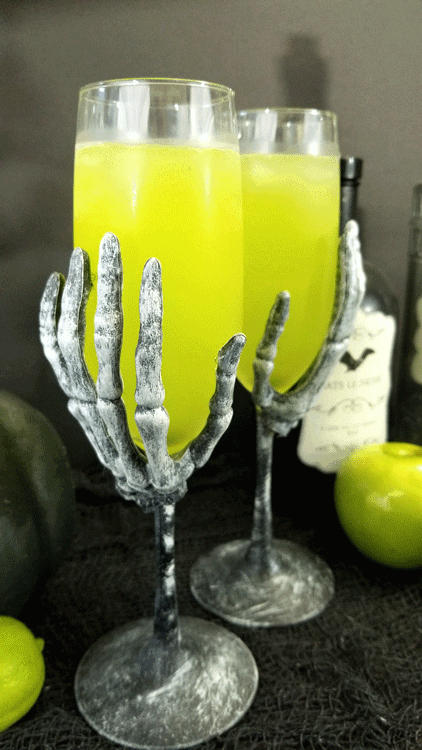 And in order to do this drink justice, probably should get my hands on a pair of skeleton hand glasses!! Fun recipe, thanks for sharing. Thank you. I agree! Skeleton glasses make the drink. LOL! I love a good margarita as well. If you like the sour apple you will love this. It has been my favorite one so far! Those glasses are so cool and I bet the apple flavor in these drinks is amazing. Thank you Sarah! They were so fun and I still love them. This drink is awesome too! I hope you give it a try. LOVE the glasses .. just the right touch for this drink. I am a fan of a good margarita, can’t wait to try this one. Sour apple and tequila. Yes please! Thank you Heather. You will like this one I am sure of it!! !